History .... It waits to be created, and later to be discovered and revealed! 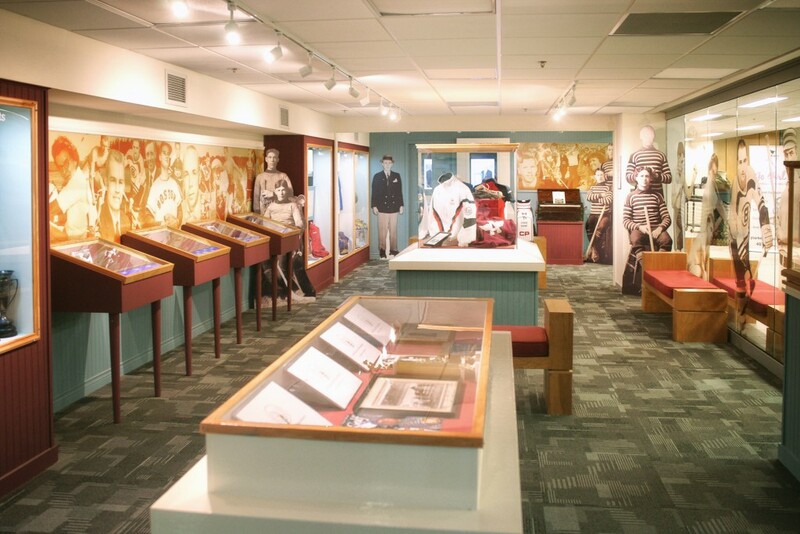 What ... who ... created the Prince Edward Island Sports Hall of Fame and Museum Inc? How has it evolved? Who were its architects? How has it grown? It all began with an idea by members of the Summerside Lobster Carnival organization in the mid 1960’s. They saw sports history in our Province lacking recognition and a central location to acknowledge those who were considered highly skilled athletes in their chosen sport. The Lobster Carnival organization was founded in 1956 by service clubs of Summerside, namely ... Legion , Ys’men, Kinsmen, and Rotary. The chair of the Lobster Carnival along with all prior chairs, were signatories to a Lieutenant Governor in Council’s partitioning of the Government of Prince Edward Island in 1967. A Board of Directors was appointed by Executive Council of the province led by its first chair Neil “Tiny” Matheson ... there followed James T. Hogan, Bill Ledwell, Clair Sudsbury, Lee Brammer, Mike Hennessy --- Paul H Schurman is the present chair. Numerous Island residents have served as directors over the years ----the practise today is to have one director from each county. Kings Director is Doug Johnston, Dave Holland represents Queens, Schurman is in Prince County, and O’Leary resident Clair Sweet is a Member-at-Large. The Chair is elected by the Directors. Nick Murray, who has assisted the organization for many years and in many facets, is the Special Advisor. Wayne Wright continues as the Hall’s Designer, a position he has held from the early beginning! The first induction ceremonies took place in July 1968 at the Lobster Carnival Celebrity Dinner, staged at the George R Pearks VC Branch Royal Canadian Legion Summerside. Charter Inductees were Alfred Groom – track and field, who held the Canadian Pole Vault record in the 1950’s , and today is President and General Manager of Quality Inn Garden of the Gulf Motel in Summerside, Vern Handrahan – baseball, who played Major League Baseball with the Kansas City Athletics in the 1950’s ... he passed away in 2017. Forbes Kennedy – hockey, who made the NHL with Chicago Black Hawks in the late 1950’s , and is one of the few players to sign a contract with all six original NHL teams. Today, he enjoys retirement in his hometown of Charlottetown. Davis Lidstone - baseball/coach, was a steady performer and later a talented Summerside High School Principal / Coach in the 1940’s and 1950’s ... he passed away in the late 1960’s. The late Norman “small d” Macdonald – sports journalist , was a high school teacher and Principal in Kensington and Summerside in the 1950’s and 1960’s. His “Sport Echoes From Prince County” column in the Charlottetown Guardian was considered to be a great promoter of PEI Sports in general. Dr. Archie MacMurdo – official , practiced Dentistry in Summerside for three or more decades and his love of baseball and officiating in the 1920’s through the early 1940’s attracted others to the game. Then there was the Alberton native the late Joe O’Brien – harness racing, who grew up in the sport with his father Harry. He raced throughout the Maritimes in his early years and then opened his own Stable in California , becoming a world class trainer / driver in the United States for more than four decades. At one time in his career he had more sub two-minute miles won , than any other harness racing driver in the world. It would be 1970 when the first female athlete was inducted ---- Mary MacLennan Lea of Crapaud, who was a world class rifle shooter, served on numerous Canadian Teams attending the Bisley Games in Great Britain. And worth mentioning here as well, are these people --- the great track and field star , Bill Halpenny, Prince Edward Island’s first Olympian, inducted in 1970 , along with the first Islander to play in the NHL, Charlie Cahill, with the Boston Bruins in 1925. Evelyn Henry Brown of Keppoch, was the first person to swim the Northumberland Strait. She also entered the Hall in 1970. Barb McNeill of Summerside, inducted in 1990, also conquered the Northumberland Strait and went on to become the first person in Atlantic Canada to swim the English Channel in 1989. In those early Induction years, many visiting professional hockey players to the Celebrity Dinner were made Honourary Members of the Hall .... Sid Smith, Gordie Drillon, Tom Johnson, Jean Belliveau, Frank Mahovlich, John Ferguson, King Clancy, to name a few. A visit to the Hall of Fame web site will list all Inductees since the founding 50 years ago! The call for nominations goes out early in the new year and Inductions usually take place in late Fall, but this year inductions will be sometime in Summer, with a date and location to be announced. The Board over the five decades would call for nominations from the general public , and then adjudicate those nominations and decide which individuals , teams and/or builders would be successful. Those not selected would have their nomination remain in the system for up to three years – following that period, if their nomination is not successful, their nominator or others may re-submit. In 2017 the Board of Directors decided to move in a new direction in regards to adjudication, by appointing two individuals from each county of the province to decide which individual athlete, team or builder would enter the Hall --- that same process will be followed in 2018. Looking back over the early days of operation, it took some six years to smooth out, so to speak, new rules, regulations and by-laws. That responsibility was shared by then Hall Chair Jim Hogan and the Provincial Director of Physical Education Dr. David M. Boswell. At the same time, it was revealed that the Department of Education would finance the Hall of Fame and also construct a building to house the elected members ... that was expected to begin in Centennial year 1973, or early 1974 ... construction of such a building didn’t happen for another two decades, part of the Wyatt Centre on the Summerside waterfront ... a 375 seat performing arts theatre and approximately 900 square feet of space for the Hall of Fame. A most successful 3.4 million dollar campaign for funds, initiated and administered by local and area citizens, enabled the Centre to open debt free. The Sports Hall of Fame has a history of moving from one location to another in hopes of finding a permanent Home. In the beginning it was housed in the Summerside Library ... then to Town Hall ... to the Eptek Centre ... and then to what was thought to be its own earned space in the Wyatt Centre ... but that was not to be. It was forced from its ‘home’ in 2014, and today occupies 800 square feet of rented space, made available by the City of Summerside, at Credit Union Place. There, the Sports Hall of Fame has allotted a designated area telling the story of Canada Games in this Province. The Hall’s splendid association with the Prince Edward Island Mutual Insurance Company has been of great benefit. For many years they have been a major sponsor of the “Banquet of Champions” where new nominees are inducted ... more than 170 individuals and sports teams to date, who have “brought distinction to PEI in any field of sport, and have made a major contribution to the development of sports in our province”. The province, as well as the cities of Summerside and Charlottetown, have continued to support the Hall monetarily, as have many individuals , businesses and organizations contributing to a Trust Fund which was established with the Community Foundation of P.E.I. earlier this year. Prince Edward Island Sports History --- is an ongoing creation --- is continually being discovered and indeed celebrated by the Prince Edward Island Sports Hall of Fame and Museum Incorporated!